Have you heard? 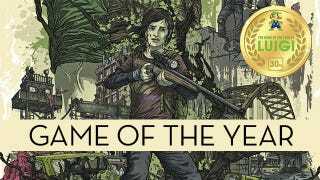 The Last of Us is Kotaku's game of the year. We're not going to talk about The Last of Us now, though. Well, not "just" The Last of Us. Over the last month, we have shared with you our top games from the year 2013. Ten picks from each of us. On average. Kinda. Following rules is hard. Top image originally illustrated by Alexander Iaccarino, modified by Luke Plunkett with a dash of influence from the folks in Kyoto.